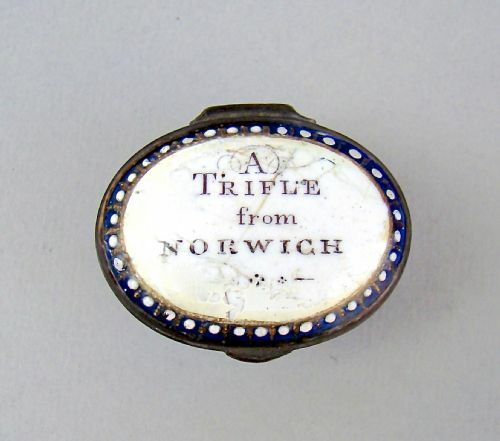 This is a delightful 18th Century Bilston * enamel patch box with a dark blue base and white hinged cover painted with the words "A trifle from Norwich". Length: 4cm / 1.6 inches. Height: 2.5cm / 1 inch. Original lead mirror pitted but not cracked. Postage UK: £7.00 Special delivery. Postage overseas: £12.00 standard International mail. * By the early 18th Century the town of Bilston, on the southern edge of Wolverhampton, was already established as a metal-working centre. The next step for these manufacturers of artefacts such as buckles, boxes and toy was get ahead of their competitors by decorating them. So they turned to enamels. The technique of enamelling is applying heat to a mixture of silica, soda, potassium silicates and lead oxide, the enameller produced a paste which could be painted on to metal surfaces. Different colours could be created by introducing various metallic oxides into the mixes. Enamellers often collected broken glasses from pubs and inns to grind them into the paste, but there were already, by the mid-1750s, suppliers selling coloured enamel powders already mixed. Bilston enamellers were particularly partial to rose pink. There were patch and snuff boxes, boxes for trinkets and jewellery, bonbonnieres. These boxes became, with the advent of transfer printing, little gift boxes given as token of love and friendship or souvenirs from various towns. This surviving example is transferred with the words "A Trifle from Norwich" . 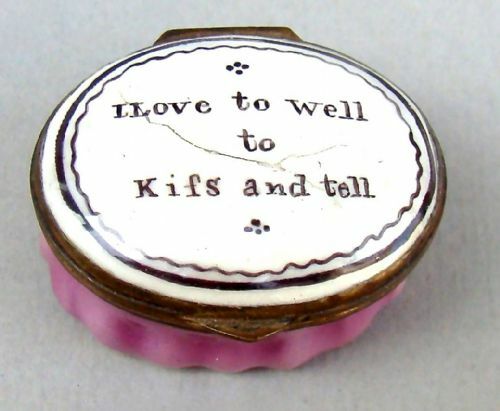 This utterly charming 18th Century Bilston * enamel patch box has a deep pink fluted oval base and white hinged cover enamelled with the words "I love to well to kifs and tell" , complete with spelling mistakes...which makes it, in my humble opinion, all the more appealing. Opens to reveal a perfect white enamelled interior, the inner lid with original, albeit cracked, mirror. Length: 4cm / 1.4 inches. In good condition with minor crack to lid and internal mirror. These type of boxes very often bear more significant damage. The technique of enamelling is applying heat to a mixture of silica, soda, potassium silicates and lead oxide, the enameller produced a paste which could be painted on to metal surfaces. Different colours could be created by introducing various metallic oxides into the mixes. Enamellers often collected broken glasses from pubs and inns to grind them into the paste, but there were already, by the mid-1750s, suppliers selling coloured enamel powders already mixed. Bilston enamellers were particularly partial to rose pink. There were patch and snuff boxes, boxes for trinkets and jewellery, bonbonnieres. The box became, with the advent of transfer printing little gift boxes given as token of love and friendship or souvenirs from various towns. This surviving example is transferred with the words "I love to well to kifs and tell". This is a charming 18th Century Bilston * enamel patch box. 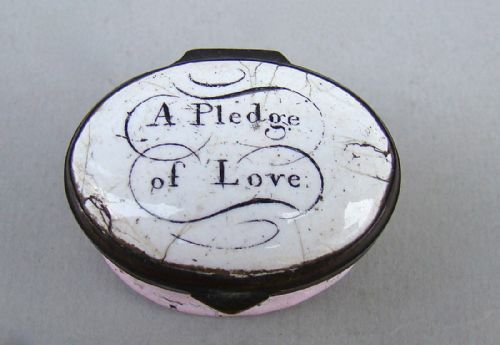 Of conventional oval form with a pale pink base and white cover painted with the words "A pledge of love". The hinged lid opening to reveal a white enamelled interior. The inner lid fitted with the original mirror. Inner mirror in very good condition, a rare occurence! There were patch and snuff boxes, boxes for trinkets and jewellery, bonbonnieres. The box became, with the advent of transfer printing little gift boxes given as token of love and friendship or souvenirs from various towns. This surviving example is transferred with the words "A pledge of love". 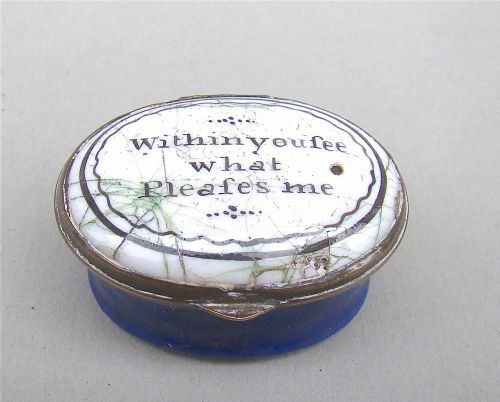 This is a delightful 18th Century Bilston * enamel patch box with a dark blue base and white hinged cover painted with the words "Within you see what pleases me". (bear in mind that in the 18th C. "s" were written as "f" hence "fee" for see and "pleafes" for pleases. A few cracks on lid. There were patch and snuff boxes, boxes for trinkets and jewellery, bonbonnieres. These boxes became, with the advent of transfer printing, little gift boxes given as token of love and friendship or souvenirs from various towns. This surviving example is transferred with the words "Within you see what pleases me" .